Southern Alameda County has had two names. Washington Township and the Tri-City area. It consisted of eight small towns: Decoto, Alvarado (Union City); Newark; Niles, Centerville, Irvington, Mission San Jose and Warm Springs (Fremont). As you enter the precinct map shows the boundaries within the township in 1909. The entry includes photographs of the villages/towns in the township. The Union City area has a picture of the demolition of the Holly Sugar factory smoke stack (1977) in Alvarado and a picture of the Masonic Home built in 1898 in Decoto. The maps include Alvarado (1876) and Decoto (1910). The Newark map is from about 1910 and the picture is of Candy Annie’s Store. The maps of the Fremont area include: Mission San Jose, Washington Corners (Irvington), Niles (Vallejo Mills), Centerville and Warm Springs. 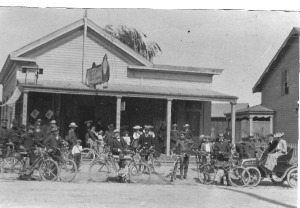 The photos include: Mission San Jose 1915, Irvington 4th of July celebration 1910, Warm Springs store (1880s), Centerville 4th of July celebration 1911 and Niles 1911. Pioneer artifacts include: A membership certificate presented to Elias Beard, as a member of the Society of California Pioneers. In the case is a gun powder horn used by Blacow family members and a gunpowder case. John C. Fremont related items include: a drawing of John C. Fremont, two books about his life, photos of flags from 1853 including the US flag, the California flag, and the flag that John C. Fremont used on one of his expeditions. City of Fremont related artifacts include: a Seal for the City of Fremont, a Fremont 25th Anniversary mirror, and a commemorative commercial map of Fremont from 1981 (25th Anniversary). A cartoon caricature of Alameda County Chamber of Commerce members from the 1950s is behind the door. Washington Township is one of the original six divisions of Alameda County, which was created in 1853. It covers an area of over 100 square miles along San Francisco Bay between Eden Township and the Santa Clara County line. It contains Mission Peak, the highest point in the county, and Alameda Creek, which gave the county its name. Mission San Jose was the first Spanish settlement in the East Bay and grew into its first town. The Mission embarcaderos (Spanish for wharf) were the first shipping centers, and Mission Pass was noted as the first road to gold mines. The first county seat, located in Alvarado, Washington Township, controlled the development of pioneer Alameda County. Washington Township was blessed with natural resources including some of the most fertile soil in California, but its greatest asset had always been the people who lived and worked here. This museum is a tribute to those people. John Charles Frémont or Fremont (January 21, 1813 – July 13, 1890) was an American military officer, explorer, and politician who became the first candidate of the anti-slavery Republican Party for the office of President of the United States. During the 1840s, when he led four expeditions into the American West, that era’s penny press accorded Frémont the sobriquet The Pathfinder. Historians call him The Great Pathfinder. During the Mexican American War, Frémont, a major in the U.S. Army, took control of California from the Bear Flag Republic in 1846. Frémont then served as military Governor of California, however, he was court-martialed for mutiny and insubordination. President Polk commuted his sentence and Frémont led a fourth expedition, which cost ten lives, seeking a rail route over the mountains around the 38th parallel in the winter of 1849. He retired from military service and settled in California. Frémont acquired massive wealth during the California Gold Rush. Frémont was soon bogged down with lawsuits over land claims between the dispossessions of various land owners during the Mexican-American War, and the explosion of Forty-Niners immigrating during the California Gold Rush. These cases were settled by the U.S. Supreme Court where Frémont was allowed to keep his property. Frémont became one of the first two U.S. senators elected from the new state of California in 1850. He was the first presidential candidate of the new Republican Party, carrying most of the North. He lost the 1856 presidential election to Democrat James Buchanan when Know-Nothings split the vote and Democrats warned his election would lead to civil war. During the American Civil War he was given command of Department of the West by President Abraham Lincoln. Although Frémont had successes during his brief tenure as Commander of the Western Armies, he ran his department autocratically, and made hasty decisions without consulting Washington D.C. or President Lincoln. After Frémont’s emancipation edict that freed slaves in his district, he was relieved of his command by President Lincoln for insubordination. In 1861, Frémont was the first commanding Union general who recognized an “iron will” to fight in Brigadier General Ulysses S. Grant and promoted him commander of Cairo. After the Civil War, Frémont’s wealth declined after investing heavily and purchasing an unsuccessful Pacific Railroad in 1866. Frémont served as Governor of Arizona appointed by President Rutherford B. Hayes and served from 1878 to 1881. Frémont, retired from politics and financially destitute, died in New York City in 1890. Historians portray Frémont as controversial, impetuous, and contradictory. Some scholars regard him as a military hero of significant accomplishment, while others view him as a failure who repeatedly defeated his own best purposes.